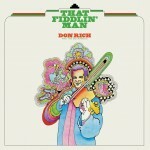 Though it was Buck Owens’ name that appeared on the marquee, he’d have been the first to say that the marquees would have been a lot smaller without his right-hand man Don Rich leading the Buckaroos. Rich was an ace guitarist, harmony singer, songwriter and fiddler, and just as responsible for creating the Bakersfield Sound as Owens, Haggard or Wynn Stewart. Though he’s best known for his stinging Telecaster, he joined Buck Owens as a fiddler, and can be heard threading his strings around Owens’ vocals as early as 1961’s “Excuse Me (I Think I’ve Got a Heartache).” He’d pick up the lion’s share of the Buckaroos’ guitar work a couple of years later, but he never gave up the fiddle. Rich cut albums backing Owens, with the Buckaroos and as a soloist, but this 1971 title is the only one to be released under his own name during his lifetime (a second album was posthumously released earlier this year as Don Rich Sings George Jones). The ten tracks were culled from previously released Owens and Buckaroos albums ranging from 1963’s On the Bandstand to 1970’s Boot Hill. The picks were surprisingly old-fashioned, with little of the kick that the Buckaroos brought to country music. Omnivore’s first-ever CD reissue adds ten more tracks drawn from similiar sources, but the selections highlight more of the Buckaroos’ instrumental sting. Rich’s fiddle is featured on each track, and his melodic lines are often drawn upon by the steel, dobro and guitar for their own spotlights. This entry was posted on Saturday, August 17th, 2013 at 8:14 am	and is filed under CD Review, Reissue, Video. You can follow any responses to this entry through the RSS 2.0 feed. Both comments and pings are currently closed.